Badar Khushnood [ badar@google.com ], a graduate of Lahore School of Economics and now Google Pakistan Country Consultant delivered a talk on "Marketing Your Business Online With Google" in Lahore School of Economics on November 27, 2007 and conducted in-person seminar. The seminar was useful for students of marketing with a special focus on Google AdWords advertising. “This seminar is designed to guide you from scratch upwards from basic introduction of Google AdWords to campaign setup and finally up to website traffic auditing with interesting success stories from corporate Pakistan,” says Badar Khushnood. Lahore School of Economics secured third position in Inter University Declamation Competition held at Kinnaird College Lahore. Syed Zain Ali (BSc Hons) and Asfandyar Khan (BBA I) represented Lahore School of Economics in Inter University Declamation Competition held on November 20, 2007 at Kinnaird College Lahore where Asfandyar Khan secured third position in the competition. The topic for the house was “ Do Men Save More Than Women”. Sidra Rana The Lahore School of Economics delegation for LUMUN07 continued in tradition to leave its indelible mark on LUMUN. This year, the Lahore School of Economics delegation for LUMUN07 representing the United Kingdom bagged six Best Delegate Awards. The awards were conferred upon Shahram Niazi (BSC II) in HGA, Ameera Safdar (BSC II) in SPECPOL, Ayesha Mirza (BSCII) in Legal Committee, Abdul Rehman (BSC I) in WTO, Anum Baig (BSC II) in H-MEMS and Syed Zain Ali (BSC Hons) in UNIFEM. Lahore School of Economics Association of Film Makers organized Lahore School Commercial Ad Competition, 2007 on Nov 16, 2007 at Main Cafeteria, Burki Campus. The competition was judged by Mr. Nabeel Ahmed from Orient McCann Advertising Agencies and Mr. Iqbal Khan (Director Case-Study Development at Lahore School of Economics). Judges also gave talk to the students on the art of advertisement and also shared their experience in the field. As per the results, Ali Hussain Piracha ("Levis" ) got first position and Aamir Saleem and Group ("Lays") and Harris Jameel and Group (“Shoes) were declared second and third respectively. 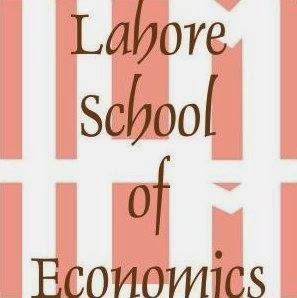 Lahore School of Economics participated in the Annual Parliamentary Debating Championship at Kinnaird College, Lahore from November 16 to 19, 2007. The Motion for the House was "This House would Allow Pirated Books in the 3rd World Countries." Lahore School team (Abdul-Rehman, Nida Rasool and Ali Hanan Malik) reached the Quarter Finals. Mr. Hamesh Khan, President Bank of Punjab visited Lahore School of Economics and gave a talk to the MBA and MSc Economics students on November 8, 2007 at the Main Campus. Lahore School of Economics has arranged a five-week workshop on Photography. The workshop will be conducted by Mr. Nadeem Rashid, a renowned photographer having experience of 25 passionate experience in the field. The first session of the workshop was held on November, 2008 at the Main Campus. Halloween - the spookiest day of the year was celebrated at Lahore School of Economics. Halloween is a colorful celebration and fun. Traditional activities include trick-or-treating, bonfires, costume parties, visiting "haunted houses" and carving jack-o-lanterns. Lahore School students celebrated the Halloween in the Main Campus Cafeteria on November 2, 2007 at Burki Campus. BBA students decorated the main cafeteria as a haunted house. Everyone was dressed up in the spookiest costumes. Students also performed a small skit on a horror script. Lahore School of Economics Sports Club is organising its second Lahore School Sports Championship – 2007. Lahore School, LUMS, GCU, Imperial College, and UMT are competing for Football, Badminton and Table Tennis from November 5 – 8, 2007at Burki Campus sports grounds and gymnasium. Football: UMT beat UCL 6-4, GCU beat LUMS 2-0. Football: Lahore School beat UCL 6-2. Football: Lahore School beat UMT (3-2) and LUMS beat Imperial College (12-0). Badminton: GC beat LUMS (7-4), UMT got a walkover. Badminton Final: GCU beat LUMS 5-2. Lahore School was runners up by defeating UMT 4-1. Table Tennis Final: GCU beat LUMS by 7-3. Lahore School was runner up by defeating UCL 5-2. Football Semi Finals: GC Vs Lahore School and UMT Vs LUMS. Football Finals: LUMS beat GCU and Lahore School was declred as runners up. 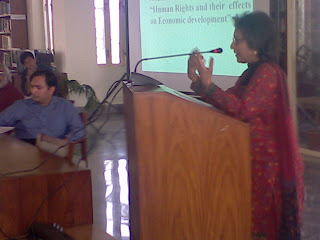 Lahore School of Economics Social Awareness Society (L S S A S) arranged a seminar on “Human Rights and their Effects on Economic Development” at Amjad Chaudhry Library in Main Campus on November 1, 2007. Renowned social activist Ms. Asma Jehangir (Chairperson of HRCP) gave a talk on the subject. Lahore School of Economics Sports Club Super Six Cricket Tournament 2007 concluded on Oct 31, 2007. Final match was played between Red Devils and Oceans 11. Oceans 11 won the final by 4 wickets. The winner team is going to play a friendly cricket match with the Alumni Cricket team on November 3, 2007 Saturday at 2:00 pm.